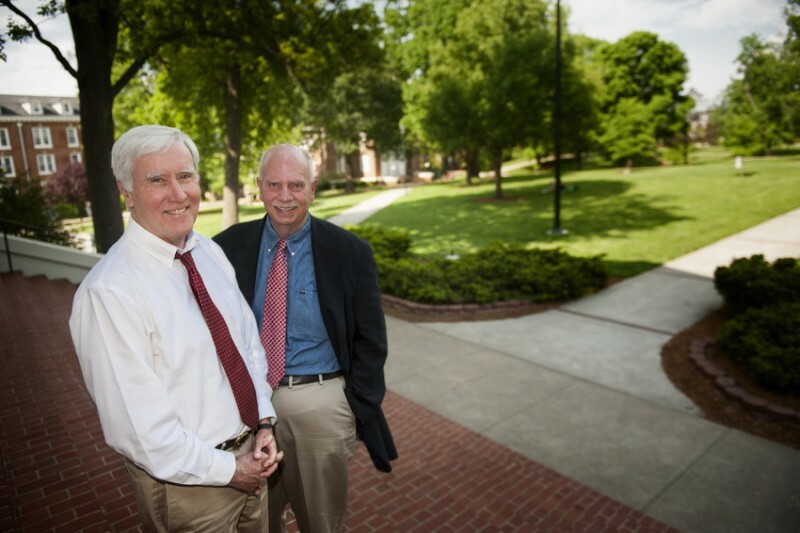 University of Lynchburg is celebrating the careers of Dr. Julius Sigler ’62 and Dr. Edward Polloway, two community icons who are retiring this summer after a combined 87 years of service to the College. Dr. Polloway, vice president for community advancement, dean of graduate studies, and the Rosel H. Schewel Distinguished Professor of Education, became one of the College’s first professors in a new special education program in 1976. He has served the College in numerous academic and administrative positions in the decades since then. He also has been prolific in research and writing about special education, and he has served as a director of professional organizations in that field. Since he took the helm of LC’s graduate studies in 2002, the College has more than doubled its graduate program offerings, and the number of graduate students has grown fourfold. Dr. Sigler, vice president and dean for academic affairs, has served his alma mater since 1967, when he completed his Ph.D. at the University of Virginia and returned to LC to teach physics. He served as the dean of the School of Sciences from 2003 to 2007, when he was appointed to his current position. Professionally, he has served as a consultant to technology companies and the National Science Foundation. Dr. Sigler is a former member of the Lynchburg City School Board and has served as chair of the board of the Central Virginia Governor’s School for Science and Technology. He currently is a director of the Robert E. Lee Soil and Water Conservation District. At two receptions celebrating these retiring leaders in June, the College announced the creation of a scholarship in their honor. The scholarships will ensure their legacies continue by supporting future LC students.